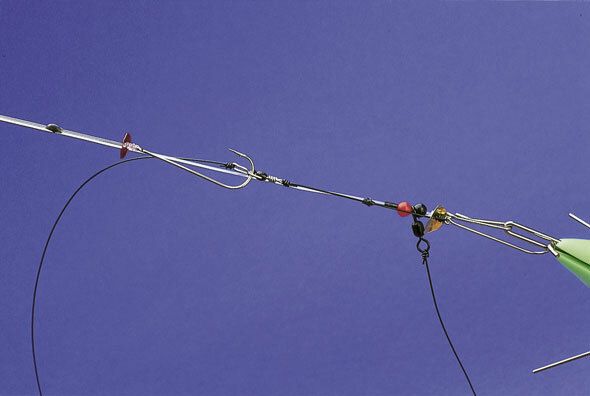 This two-hook rig is your best possible configuration for achieving maximum casting distance. The one-up, one-down loop arrangement places two baited hooks directly behind the lead weight for minimum drag so the sea angler can gain those extra yards. 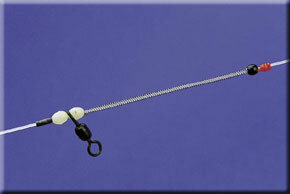 Also known as the one-up, one-down clipped rig, Loop, Portsmouth rig and the Golds rig after matchman Ian Golds of Portsmouth, who first came up with the idea of using an inline Cascade swivel on the lower hook, snood. So what was the rig designed for? It is primarily for fishing at extreme range with fairly large baits so it can be used for cod or freelance fishing situations when a bait has to be fished that little bit further out. It can be made in a two-up, one-down format for match ishing; we will show you how to make this particular rig a little later in the series. The rig is so streamlined it can beat the weather, making it particularly effective for punching baits into a strong head or side wind. As with all clipped rigs in this series, a Gemini SRT spring is included in the rig below the top snood to tension the clipped down baits. 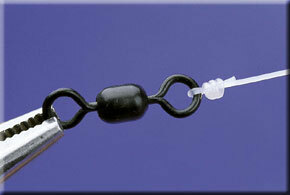 This is very effective when the wind is buffeting the cast and you need to keep the baited hooks in their clips. This configuration of two hook snoods is fairly tangle-free and enables you to space several hooks further apart than most other rig designs. Made with long snoods, this rig is the perfect answer for your long-range match fishing for dogfish or ray using a frozen sandeel for bait. As with all of the power casting or long-range rigs in this series we recommend you only use top quality components, especially those that are under stress during the cast. 5 x micro rig beads. 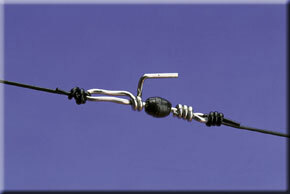 The top snood hook clips into the Cascade swivel on the lower snood and the lower snood hook onto the wire hook on the Impact Lead. You will see there a loop of line left hanging and this is where the rig gets its name. It does not restrict the rig. It is essential to include a Gemini SRT spring on the top hook snood to tension the snoods and counter any chance of premature release in a buffeting wind.